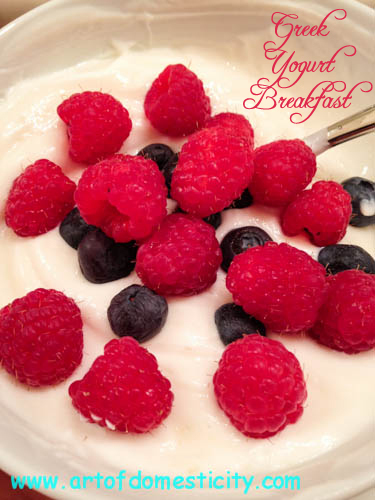 This Greek Yogurt Breakfast is one of the easiest breakfasts you can make, and it's super healthy and yummy! Doesn't it look fabulous? I don't know how you feel about greek yogurt. I've heard lots of mixed reviews. Some are cuckoo for cocoa puffs over it; others think it's nasty. Personally, I think it tastes a wee bit like sour cream when served plain. But I'm a HUGE fan of the massive protein punch that it provides (23g of protein per cup!!). Soooo....want to know my trick? Simply, combine the greek yogurt and honey until thoroughly mixed. Top with fruit. Sooooo good! And may I remind you, it's 23g grams of protein!! That's super handy for this borderline hypoglycemic. It definitely holds me until lunch time. And it only has 5 WW points plus! I'm with you on this one. I am a bit dairy intolerant so I can only have 1/2 cup, but I add 1 T. of chia seeds and find I am not hungry at all until lunch. Yum!